The old notion of ‘bugging’ – of microphones under desks or cameras hidden in mirrors - is long gone, it’s archaic, out with the Nixon era. There is no need for that clunky hardware now because we are all connected via computer. So our data, texts, videos and e-mails, are all accessible for anyone with the technology. The question is - who has the technology and why would they use it? It’s a relevant and pertinent question at this point in time, when the American political system seems poised to put power into some extremely dubious hands. Oliver Stone’s movie Snowden leaves us in no doubt that the intelligence community has access to everything, linked as it is to the servers of the biggest Internet companies (Google, Apple, etc.). Data-gathering, under the guise of a ‘war against terror’, has evolved along with the tech, and we were so busy playing with new technology ourselves, that we didn’t notice that we have voluntarily put ourselves out there to be scrutinised. Undoubtedly there will be those that will accuse any Oliver Stone movie of being leftist-conspiratorial propaganda, but I for one, didn’t see Snowden that way. For me, Snowden is a gripping procedural docu-drama that takes a hard look into what surveillance technology has become. Perhaps you decided long ago that Edward Snowden was a ‘traitor’ to his country when leaked documents and revealed some of the lies and secrets of the NSA. Or maybe you saw Laura Poitras’s Citizenfour, that presented the interview Snowden gave just before he went on the run, and decided that he was a brave whistle-blower who risked all by speaking out when he saw human rights and freedoms being abused. Dealing with the experiences of a real individual, Snowden is more restrained than some of Stone’s other films - it asks the audience to consider what the issue of surveillance really entails, but also to take a closer look at Edward Snowden, the man. Edward Snowden (played with diligence by Joseph Gordon-Levitt) is, at the outset, hardly crusader material or even particularly liberal. He’s a mild-mannered conservative who loves and trusts his country and wants to defend it. In 2004, he’s in the United States Army Reserve (he joins up after 9/11), but he goes through gruelling basic training wearing glasses. When he leaps off his bunk one morning he breaks his leg because the pounding he’s taken has created hairline fractures throughout his bones. His career as a combat soldier is over, so he takes a shot at the CIA, where the fight is on the battleground of the future —cyberspace. During his interview with Corbin O’Brian (Rhys Ifans), who will become his mentor, he is told that he isn’t typical CIA material, but what he is, is cool as a cucumber and a (self-taught) computer prodigy. He has ‘the right stuff’ to be a soldier in the next war. Corbin tells Edward that in twenty years, “Iraq will be a hellhole no one cares about,” and that the war on terror is just a sideshow. The real conflict will be with China and Russia, fought with rogue computer worms and malware. Gabriel (Ben Schnetzer) a laid-back colleague, shows Edward a few things he’s not authorised to see, including the ‘optic nerve’ and demonstrates how it can enter any location right through a webcam, computer, phone or the screen itself. At home, Edward puts a band-aid over his webcam, because he now realizes how someone could be spying on at him and his left-of-centre, liberal girlfriend Lindsay (Shailene Woodley). He’s not being paranoid, he’s just become aware. The dialogue in Snowden is full of technical jargon, but it’s enough to know that most of it is concerned with keeping secrets, distancing oneself from acts of assassination and the collateral damage that entails, and ultimately covering up the truth. Snowden struggles with his knowledge about the mass of data being assembled to track all forms of digital communication - not just from foreign governments and terrorist groups, but from ordinary people. Disillusioned with the intelligence community, Snowden decides to leak this classified information. He is well aware what it means – he will become a traitor to some, a hero to others and certainly, a fugitive from the law. The film is framed by Poitra’s Citizenfour interview, which took place in the Mira Hotel in Hong Kong. Melissa Leo plays Poitras and Zachary Quinto is Glenn Greenwald, the fiercely independent journalist who interviewed Snowden for the camera. Tom Wilkinson and Joely Richardson play the representatives of The Guardian newspaper. Stone’s film conveys the tension beneath the secret meeting, we are fearful that the CIA might burst in at any moment. The tension ratchets up as they wait to see whether they will be able to publish the sensitive information in the London-based Guardian – their only chance to expose the truth before Snowden will have to disappear. We come to realise what is at stake. Playing Snowden is a brave move for a young actor, the production of the film was unsurprisingly fraught with difficulties. 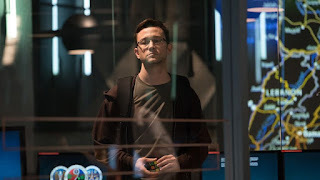 Joseph Gordon Levitt manages an excellent impersonation of the real Snowden: clipped, articulate, cool and logical even in the most stressful of circumstances, so much so that at the end of the movie we morph to the real Edward Snowden, and we realise the reality of what we have been watching – this man is still living in Moscow, effectively stateless. Whether pro-Snowden or anti-Snowden, this movie sets out to educate us about our own security, deepen our understanding of the issues and also of the man and his actions, and if that isn’t enough to encourage anyone to see it, Snowden the movie also works as the ultimate true-life hacker thriller.